Are you scuba-certified and looking for something new? Try ice diving and uncover a hidden realm waiting beneath the frozen surface of the world’s oceans. Scuba diving is one of the world’s most enriching adrenaline activities and opens up a whole new realm of adventure. But, what many don’t realize is that the adventure can go far beyond the tropical reefs and vibrant marine life that are most often associated with the sport. Pack your dive gear into a sturdy bag like the No Matter What™ Flatbed 32 and get dry-suit certified so you can start diving beneath the frozen surface of some of the world’s most spectacular winter landscapes. It's called ice diving, and it's incredible. Once you’re ready to go, consider heading to one of these five amazing destinations. More than 20 historical shipwrecks, including an elegant passenger steamer and a two-masted schooner, line the floor of Fathom Five’s Tobermory harbor. This park, which is covered by a thick layer of ice during the frigid winter months, offers some of the best freshwater diving in the world. Divers who dip their heads below the waterline can also explore submerged geological formations like cliffs, caves, and overhangs. Although diving is allowed there year-round, the winter months are the best time to experience diving under the layers of ice that cover the harbor. Slip down into the inky depths of the White Sea and you’ll discover that it plays host to a surprising amount of marine flora and fauna. Diving this stretch of the Russian coastline requires a certain amount of precaution. While tethered to both your diving buddy and the surface via an ice diving umbilical, you’ll likely find anemones, sponges, algae, sea stars, sea urchins, bright soft-coral colonies, shellfish, and nudibranchs. Even better: Beluga whales and seals are often on site and keen to play. March and April offer the best diving conditions, when the sea is still frozen but the snow has already melted, making the dive sites more accessible. 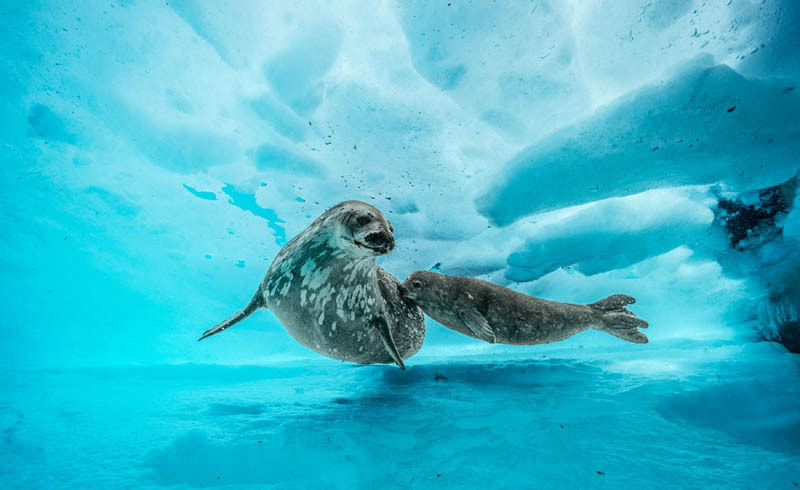 Noted for its unspoiled national parks and its variety of wildlife above the waterline—including brown bears and deer—Japan’s Shiretoko Peninsula, which protrudes into the Sea of Okhotsk, is also a key area for drift ice diving. Donning a dry suit and entering the flow of ice that begins to break up between February and March each year is an experience quite unlike any other, not least because it’s one of the few places that divers can see sea angels or clione. Icebergs in Greenland have long been used as natural signals of the changing seasons. And diving under these vast, frozen forms is a specialty in the region. Here, majestic blue icebergs, a vibrant seafloor, and numerous ice caves make for a memorable scuba experience. Divers can even opt to stay in nearby huts on the banks of the fiord, so be sure to pack some essentials in your daypack (such as thermal layers and a Fast Inflate™ Pillow) and take advantage of the opportunity to camp out on the ice. Plan your trip for August or September when the whales arrive from the south and there are still icebergs drifting down from the frozen north. In Antarctica, the gin-clear waters, sunlight, and vast ice shafts create an otherworldly atmosphere that is quite unique to the region. Here, divers can encounter marine life that isn't found anywhere else on Earth. November through March is the best time for scuba enthusiasts to visit. When the southern summer returns, Crabeater seals give birth, phytoplankton blooms, and numerous whale species return from their migrations. 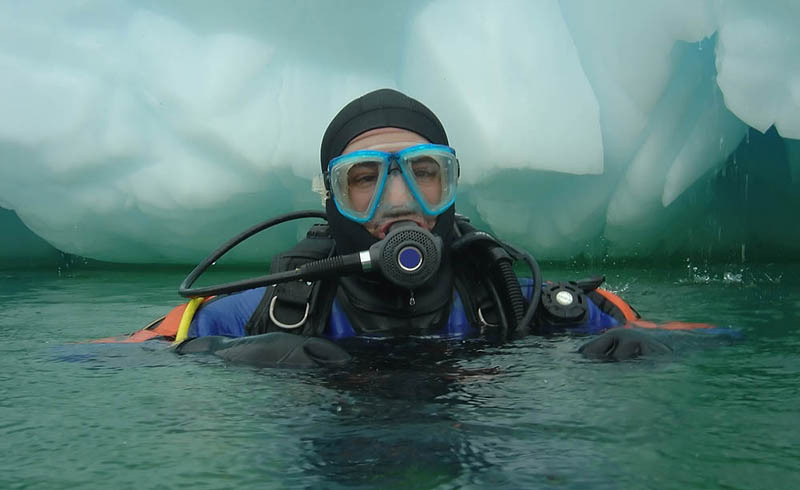 When you’re partaking in ice or cold-water diving, there are additional considerations for both dive practice and equipment, compared with warm-water diving. Divers should complete the necessary training to ensure that they have the additional skills needed, can operate the required equipment, and can manage the effects of low temperatures on their bodies. For more insight, speak to an ice diving professional before you go. Whether you plan to ice dive in the Americas or closer to the poles, there are plenty of inspiring marine landscapes to captivate your imagination, so start your scuba training and book a cold water dive trip today!